We are fond of baby potatoes and use them quite frequently. Elsewhere in this blog, you will find recipes that use baby potatoes, such as Semolina Roast Potato, Urulai Idicha Masala, and Minty Baby Potatoes. I was very keen on trying out this dish called Tilwale Palak Aloo , which I have adapted from this video in Master Chef Sanjeev Kapoor's Khana Khazana. 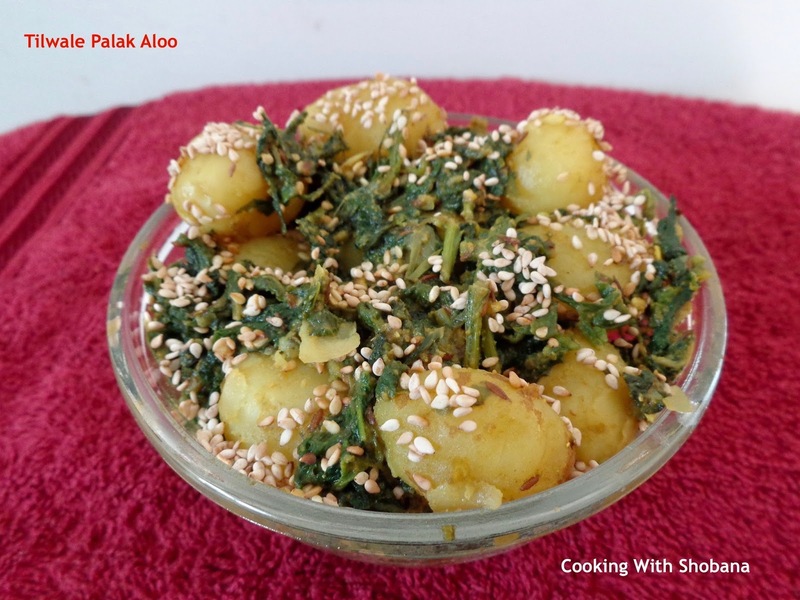 The sprinkling of the roasted Sesame Seeds (Til in Hindi) to the dish of baby potatoes and spinach gives it a very distinctive taste. I chose to boil the baby potatoes and peel the skin though the original recipe calls for them to be cooked with their skins. Also instead of quartering the potatoes, I used full baby potatoes. We loved this dish and would suggest you try it out too! Dry roast the sesame seeds till they change colour and keep aside. Wash and cook the baby potatoes in adequate water in a pressure cooker for 2 whistles. Once the cooker cools, remove the baby potatoes, let them cool, peel them and keep aside. Wash the spinach in several changes of water and roughly chop them. Keep aside. Heat oil in a kadhai and when it is hot, add the cumin seeds. When they begin to change colour add asafoetida, saute for a few seconds then add the slit green chillies, boiled and peeled baby potatoes and salt.